A biodiesel company needed confirmation that a manual valve was in the correct position before beginning a reactor process. They required a specialty valve with a flanged connection on one side of the valve and triclamp on the other. The Assured Automation 36X Series Stainless Steel 3-Piece Ball Valve offered the perfect solution. 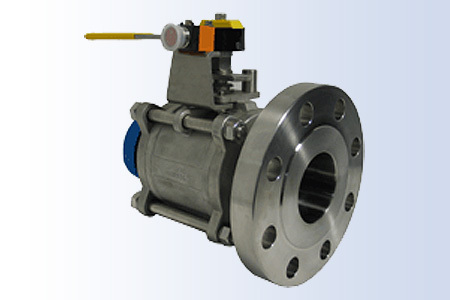 This 36 Series valve is a 316SS, 3-piece, full port 2-way ball valve with a Tri-clamp end connection on one side and a 150# flanged connection on the other side, and 50/50 seats for steam service. The Assured Automation UB limit switch was selected, since it features a compact, low profile design. It also features proximity limit switches, M12 connector and cordset, and a visual OPEN/CLOSED indicator with lights. The feedback switches confirmed valve position and provided local visual indication of the valve position. This entry was posted in Biofuel Industry, Custom Projects and tagged 2-Way Ball Valves, 3 Piece Ball Valves, 36 Series, Custom Ball Valves, Flanged Ball Valves, Full Port Ball Valves, Limit Switches, Manual Ball Valves, Manual Valves, Stainless Steel Ball Valves. Bookmark the permalink.